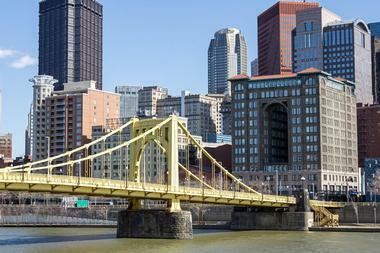 At some point, everyone should visit Pittsburgh, as the city itself is exciting and provides easy access to various other nearby attractions. Whether you are visiting for business or pleasure, your comfort is key, which is why choosing your hotel is very important. Luckily, there are choices to meet a range of tastes, whether you want a chain hotel where you can earn rewards and stay in a familiar environment or prefer small, family-run accommodations. 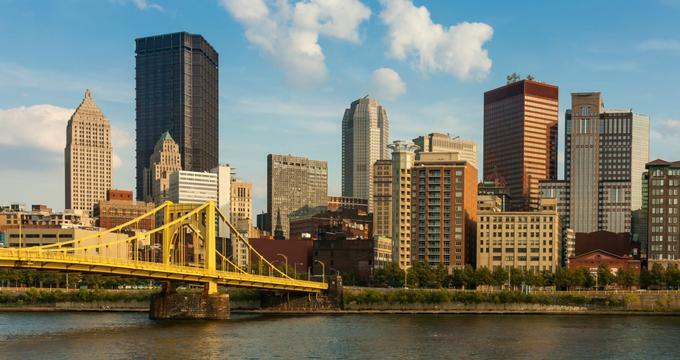 Just take some time to consider what amenities you need from the hotel, what part of Pittsburgh you want to stay in, and your budget, and you will be ready to book a hotel. 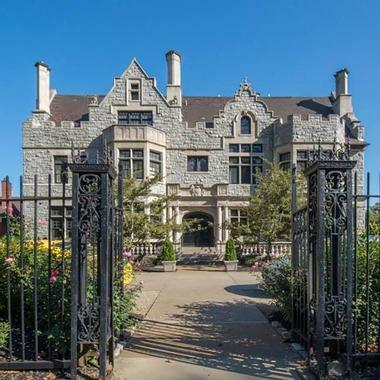 The property holding Mansions on Fifth used to house one of the most prominent attorneys in the city, but now hosts guests in luxury. All guest rooms have spacious bathrooms with ceramic and glass shower enclosures, organic amenities from Gilchrist and Soames, and thick towels made from bamboo fibers. You can choose a room with a jetted tub and/or fireplace. The Presidential Suite even has two baths and bedrooms plus almost 1,000 square feet of living areas. When the weather is nice, head to the front veranda to people watch, admire the local architecture, or just relax. In the winter, you will appreciate the gas fireplaces throughout. The Front Desk has staff 24/7 to answer your questions as well as help with check-in and check-out. Butlers are also available daily for services, including bell and valet. Guests also get to enjoy the fitness center, a guest computer with printer, complimentary onsite parking, and complimentary wireless internet. The morning begins with a continental breakfast that is complimentary, or you can opt for a heartier a la carte breakfast for an additional fee. In the afternoon or evening, have a craft cocktail, microbrew beer, or fine wine at the Oak Room pub. 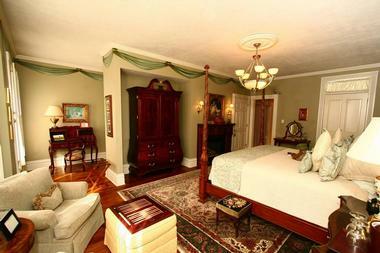 The Mansion at Maple Heights is a bed and breakfast with six suites, each of which is fully renovated. Each suite has its own personality along with the amenities you need, such as air conditioning, daily housekeeping, a full (or king) bed, a clock radio, a TV, free wireless internet, complimentary toiletries, and an iron with ironing board. One also has a steam room, a separate living and dining room, three TVs with DirecTV, a Jacuzzi tub, and an in-room coffeemaker. There is secure, gated parking on site. Upgrade your stay with a ride to the Mansion in an Executive Lincoln Town Car. You can also book an in-room massage or a couple’s massage. A full breakfast for two is always included in the room rate, and the menu is very extensive with the ability to accommodate those with dietary restrictions. The building housing the Ace Hotel Pittsburgh used to be the YMCA building and is a century old. 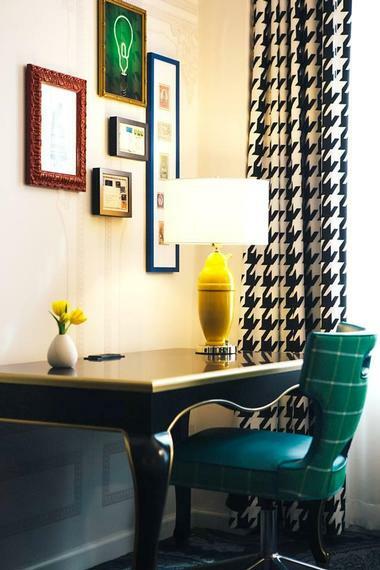 Small rooms are the simplest, about 250 square feet with a utilitarian desk, a king or queen bed, a Pendleton quilt, a window seat, a flat-screen TV, Tivoli radio, Rudy’s toiletries, Pearl+ soaps, free wireless internet, and a fully stocked minibar. Medium rooms are about 300 square feet, adding plenty of room for writing and books. Large rooms always have king beds and are about 375 square feet with ADA accessibility. Finally, suites are 450 square feet with plenty of natural light, a Music Hall turntable, plus an acoustic Martin guitar. There are public spaces in the hotel perfect for meeting new people. Dine at Whitfield, the hotel’s neighborhood tavern with inspiration from the region. Get seasonal cocktails, wine, or craft beer in the lobby bar or start the day at the coffee bar with beans roasted by Stumptown Coffee Roasters as well as fresh pastries. The Inn on Negley is in the Shadyside area, a historic and charming area close to downtown, Carnegie museums, and universities. The eight guestrooms each has its own custom feel with exquisite antiques and period furnishings. All accommodations have private baths with L’Occitane bath and spa products and hairdryers. You also get illuminated vanity mirrors, luxurious slippers and robes, irons with ironing boards, BOSE radio, free Wi-Fi, private phones with voice mail, and cable TVs with a DVD player. 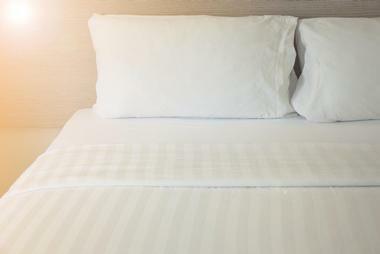 The inn provides evening turndown services in addition to housekeeping. Guests are welcome to relax in the Fernwood Dining Room and Parlor, where you will find daily newspapers. Guests can book an in-room massage. The day begins with a gourmet breakfast made by the inn’s professional chef, with the menu available the night before and dietary modifications available with notice. The complimentary beverage bar has tea and coffee at all hours, and in the evening, there is iced tea and homemade cookies. From 5pm to 7 pm, there are complimentary wine and cheese. Additional gourmet indulgences are available. You can also opt for daily brunch or high tea, or plan lunch or dinner with notice. The Parador Inn has a Caribbean theme and is a bed and breakfast perfectly situated along the North Shore of Pittsburgh. The property has exquisite historic spaces and elegant guest rooms. The rooms embrace the elegance and grandeur of its previous life as private mansion but with a Caribbean flair. All rooms are unique, but each has cable television, a hairdryer, a coffeemaker, a fridge, an iron with ironing board, and central air with filtration along with a full, private bath. There are also upscale touches like a gas log fireplace in every room. Guests are welcome to explore the gorgeous gardens, where you will find tropical-themed plants, quiet nooks, water features, and more. The entire property has secure high-speed Wi-Fi, so you can stay connected in your room, the common areas, or the gardens. There are numerous public spaces for you to socialize with the other guests if you want. The Lake Worth Sun Room has a waterfall and tropical plants from Lake Worth, Florida. The Formal Parlor has Victorian sofas perfect for relaxing while sipping port. The library has an oversized round table for playing games. Guests also get complimentary access to the nearby YMCA. Each morning begins with a full American breakfast in the dining room between 8am and 10am. 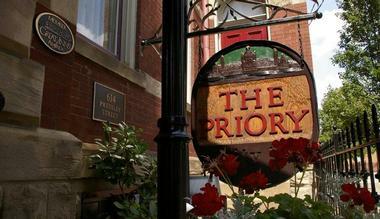 The Priory Hotel holds the title of being the only historic boutique hotel in Pittsburgh. This property has 42 rooms and has been restored to meet modern standards while maintaining its historic charm. All the rooms have modern amenities, such as safes, hairdryers, and irons with ironing boards plus complimentary high-speed wireless internet. Rooms have either tubs or shower/tub combinations and feature a king or queen bed. There are also suites with sitting rooms featuring pull-out couches, single rooms, and one apartment suite spanning the full fourth floor. The entire hotel has wireless internet. Guests can take advantage of the on-call shuttle and business center or visit the fitness center to get in a workout. Relax in the hotel’s sitting room, where you will find a working wood fireplace. Or go outside to enjoy the Victorian porch and verdant garden courtyard. On weekdays, there are morning shuttles to destinations on the North Side and downtown, making it easy to visit attractions. The day begins with an expanded continental breakfast. Get a drink at the Monk’s Bar, which is the smallest bar within the Commonwealth of Pennsylvania, but still has a wide selection of microbrews, wine, and top-shelf liquors. 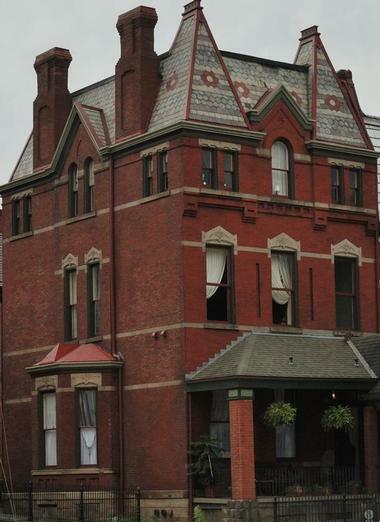 The Allegheny Inn is in a Victorian townhome originally built in 1880. The property has been completely restored and now includes modern amenities while maintaining its architectural heritage. The property originally had eight bedrooms, but following the renovation, it now has five larger guest rooms. Each is period-appropriate with its own unique appointments and a full, private bath. Expect individually controlled thermostats, showers, luxurious beds, and possibly an antique clawfoot soaking tub. There are several social areas within the inn’s common areas, including comfortable sofas, chairs, and more. Every night, the inn hosts complimentary spirit and wine tastings for their guests. 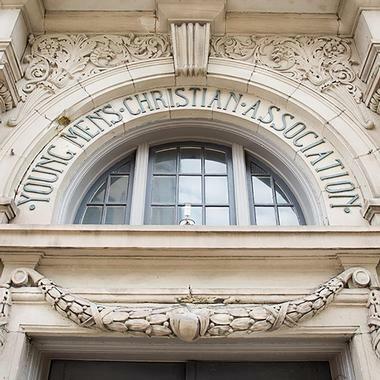 The property was built in the Second Empire style, complete with a mansard roof in the front. At the time of construction, it was one among the designs that were the most progressive in the area, with influences likely coming from an East Coast architect. The building housing the Kimpton Hotel Monaco Pittsburgh was built in 1903 in the beaux arts style and known as the James H. Reed building. The property has 248 guest rooms, which includes 13 suites. Every room has a yoga mat, luxury Atelier Bloem bath amenities, Frette linens, pillowtop mattresses, and oversized desks with ergonomic chairs. Rooms can have one or two queen beds, or a king bed and you can opt for a corner room or a room with a view. Guests can access the onsite fitness center or guests can borrow a PUBLIC bike. There are same-day dry cleaning and laundry services. Although there is no spa on site, you can order in-room spa services such as massages. There is an evening wine hour within the lobby’s living room. Dine at the Commoner to enjoy American classics mixed with unexpected flourishes or head to the Commoner Corner, which is a smoked-meat carvery facing the sidewalk. Go up to the rooftop Biergarten for a drink at the end of the day. 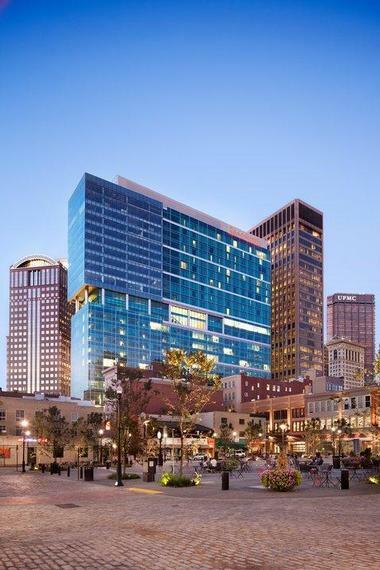 The Fairmont Pittsburgh is in the heart of the city’s hub for dining, business, and culture, delivering views of PNC Park plus the skyline and restored downtown. The hotel’s 185 guest rooms and suites are luxurious, and each has contemporary décor, seamless technology, and comfortable amenities. Here you will find the biggest guest rooms within the city, including standard four-fixture bathrooms and floor-to-ceiling windows. Other amenities include a large working desk, luxurious beds, easy-to-access plugs and lights, and spacious bathrooms. Suites add powder rooms, living areas, kitchenettes, dining rooms, and more. Wireless internet is available in all rooms. The property’s Health Club & Spa is perfect for getting in a good workout or relaxing with a beauty treatment. Guests can take advantage of pressing service, overnight shoe shine, and same-day laundry. The hotel is also pet-friendly for a small fee. Get a modern American meal at fl.2 or sip cocktails while listening to jazz music at Andys Bar. 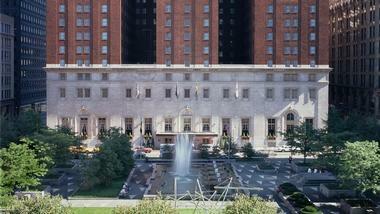 The Renaissance Pittsburgh Hotel sits in downtown for easy access to the most popular attractions along with luxurious accommodations. The property has 291 rooms and four suites across 14 floors and it is pet-friendly for a small fee. In your room, you will find everything you need to make coffee and tea as well as a mini-fridge, and a safe deposit box. Every room also has a Sony alarm clock, iPod dock, 12-foot ceilings, flat-screen TV with satellite and cable channels, luxurious bedding, marble vanities, shower/tub combinations, hairdryers, Web TVs, bathrobes, electrical adapters, and individual climate controls. Club Level rooms add bottled water and you can also enjoy in-room dining, rollaway beds, or cribs. Get in a workout at the 24-hour fitness center, where there are free weights and cardio equipment, or use the computers in the Business Center. The property has complimentary wireless internet throughout for convenience. Guests can also take advantage of the valet dry-cleaning, the Concierge Club for Elite Members, the virtual concierge, and newspapers in the lobby or delivered to your room. Be sure to get a meal at Braddock’s Pittsburgh Brasseries for American and European cuisine with Pittsburgh influences. 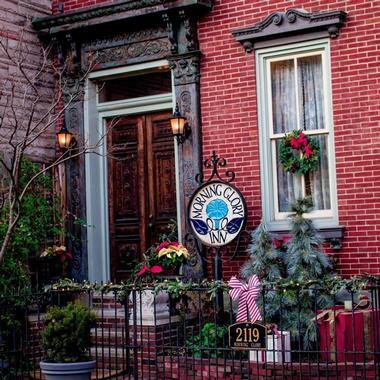 The Morning Glory Inn is in a brick Victorian townhouse from 1862 that is in the Italianate style. Each of the five rooms has its own unique décor with timeless elements such as fireplaces and claw foot tubs plus modern amenities. Expect things like wicker furniture, four-poster beds, workspace, spacious fireplaces, and views of the slopes. There is also an Attic Suite perfect for those in search of privacy; it has two stories, so the writing room and sleeping areas are separate. The property also has meeting venues, both indoors and outdoors, along with a SMART Board interactive display and complimentary wireless internet. The day begins with a complimentary breakfast, so you don’t have to worry about finding somewhere to eat. You will find numerous local attractions within walking distance and there are over 50 restaurants plus blues and jazz clubs and shopping within 3 miles of the inn.